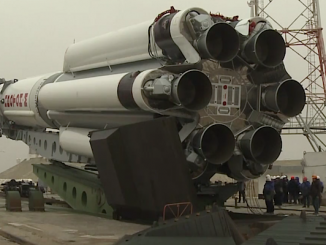 EDITOR’S NOTE: Updated at 1910 GMT (2:10 p.m. EST) Tuesday with confirmation of liftoff. Updated at 1630 GMT (11:30 a.m. EST) Wednesday with confirmation of a problem with the Angosat 1 satellite. A nearly 20-story-tall Zenit rocket lifted off with the Angosat 1 spacecraft at 1900 GMT (2 p.m. EST) Tuesday from Site 45 at the historic spaceport in Kazakhstan, where launch occurred at 1 a.m. Wednesday local time. A live webcast of the launch provided by Roscosmos showed the Zenit booster climbing through low clouds over the frigid launch base, heading northeast over the Kazakh steppe. Deployment of the 3,631-pound (1,647-kilogram) Angosat 1 satellite from the Zenit’s Fregat upper stage was expected at 0354 GMT Wednesday (10:54 p.m. EST Tuesday) after three Fregat engine burns to place the spacecraft into a circular near-geostationary orbit more than 22,000 miles (nearly 36,000 kilometers) over the equator. Press statements from Roscosmos — Russia’s space agency — and Angosat 1-builder RSC Energia confirmed the satellite was released into the planned orbit around nine hours after liftoff. But ground controllers detected trouble soon after the satellite separated from the Fregat upper stage. Roscosmos and Energia said ground teams initially established contact with Angosat 1, but they later stopped receiving telemetry data from the spacecraft. 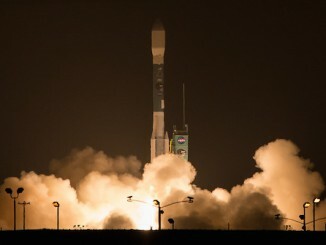 Work was underway Wednesday to restore communications with the satellite, according to Roscosmos and Energia officials. A report published by Russia’s Tass news agency said engineers lost contact with Angosat 1 at the time it was supposed to extend its power-generating solar panels after separation from the Fregat upper stage. The earlier stages of Tuesday’s countdown and launch appeared to go normally. The Zenit rocket, running on an automatic countdown sequencer, was fueled with kerosene and liquid oxygen propellants in the final hours of Tuesday’s countdown at the Site 45 launch pad. The rocket rolled out to its launch pad in Kazakhstan on Sunday aboard a specially-designed rail car. The Zenit 3F rocket launched Tuesday was powered by a two-stage booster designed by Yuzhnoye and manufactured by Yuzhmash in Dnipro, Ukraine. The Zenit booster released the Angosat 1 satellite and a Fregat SB upper stage in a preliminary low-altitude parking orbit around eight-and-a-half minutes after liftoff. The Fregat SB stage, made by NPO Lavochkin’s factory near Moscow, fired three times to guide Angosat 1 to its targeted geostationary-type orbit, where the satellite’s velocity will keep pace with Earth’s rotation, allowing it to hover in the same position in the sky. Angosat 1 is Angola’s first communications satellite, the product of an inter-governmental agreement signed between the Angolan and Russian governments in 2009. 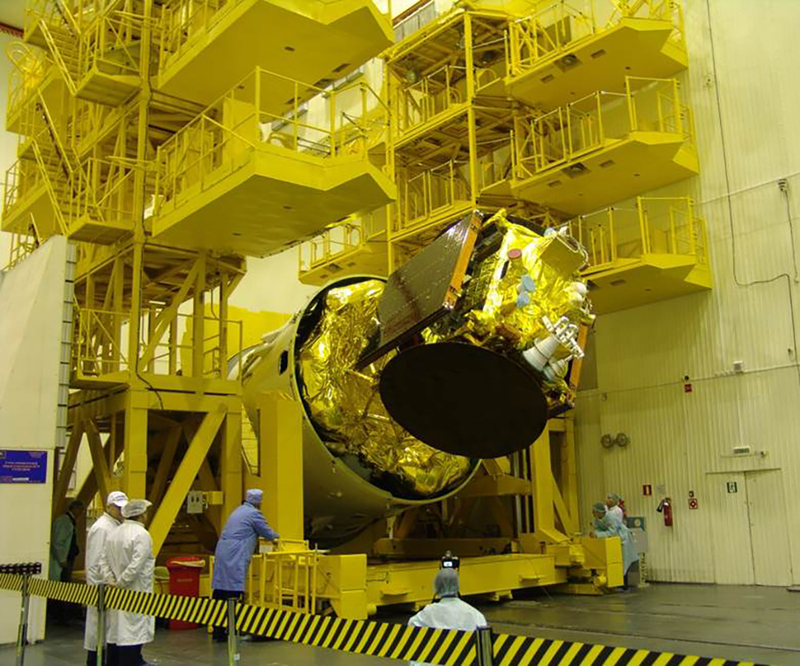 Built by RSC Energia, a major Russian aerospace contractor, Angosat 1 is designed for a 15-year mission providing television broadcast, Internet, radio and other telecommunications services to Angola, the rest of Africa and parts of Europe. The satellite carries 16 C-band and six Ku-band transponders, and controllers will position it along the equator at 13 degrees east longitude to start its mission. Airbus Defense and Space reportedly supplied the communications payload for the Angosat 1 satellite. Russian engineers also helped construct and activate a satellite control center near the Angolan capital of Luanda on the southwest coast of Africa, where officials will oversee Angosat 1 operations. The launch of Angosat 1 aboard a Zenit rocket was a rare example of cooperation between Russia and Ukraine, whose relations have soured since 2014 with Russia’s annexation of Crimea and involvement in an ongoing civil war. Angosat 1 was originally supposed to blast off on a Zenit rocket from Sea Launch’s commercial ocean-going platform in the Pacific Ocean. But Sea Launch flight operations ceased in 2014, and Russian officials considered launching Angosat 1 on the heavy-lift Angara 5 rocket before deciding last year to put the satellite on a fully-assembled Zenit booster already in storage at the Baikonur Cosmodrome. At the time of the last Zenit launch in December 2015, there were no more missions on the Ukrainian-made rocket’s manifest, leaving the Zenit program’s future in question. 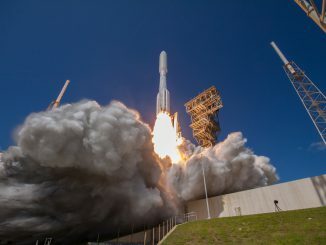 But with the switch of Angosat 1’s launch to a Zenit rocket, and the purchase of Sea Launch infrastructure mothballed in Long Beach, California, by a commercial Russian airline company, there are plans for the resumption of Zenit missions in the future. The new Sea Launch company, called S7 Sea Launch, ordered a dozen new Zenit launch vehicles from Yuzhmash in April for ocean-based missions and flights staged from the Baikonur Cosmodrome. Another Zenit rocket is slated to launch a long-delayed Ukrainian telecom satellite from the Baikonur Cosmodrome next year.